At ISE 2019, WyreStorm and Domotz will showcase the latest in A/V signal distribution with remote network management functionality. WyreStorm is partnering at ISE 2019 with Domotz to show how A/V signal distribution systems can benefit remote network management tools. At the Integrated System Europe (ISE) 2019 show in Amsterdam, WyreStorm and Domotz will join forces to demonstrate remotely monitored A/V distribution solutions. Exhibiting in booth number 1-N100 during the show, which takes place on the week of Feb. 5-8, the two companies will showcase how their products can be combined to create state-of-the-art A/V systems that incorporate the latest in dealer convenience functionality. "Domotz is the premier remote monitoring and management tool used by professionals to help bring excellent customer service and at the same time, lowering the cost of operations," notes J.B. Fowler, chief revenue officer, Domotz. "Domotz is excited to be working closely with WyreStorm to enable integrators to remotely understand what is happening in the systems they are deploying." WyreStorm explains that with remote access that includes system status monitoring, as well as support and issue notifications, Domotz's remote system management technologies can aid integrators' recurring revenue opportunities. Integrators that use the new Tile that is built into the Domotz management platform can immediately access updates and remotely monitor their NetworkHD AV over IP product line installations. WyreStorm emphasizes the remote management functionality of Domotz reduces truck rolls to increase the profitability of their installations through management service contracts. The Tile function provides integrators with detailed information about WyreStorm products to help them remotely solve or physically resolve system issues as quickly as possible. In addition, WyreStorm says that Domotz's notification features allow integrators to be immediately informed if an event occurs, which is helpful for logging or fault-finding purposes. 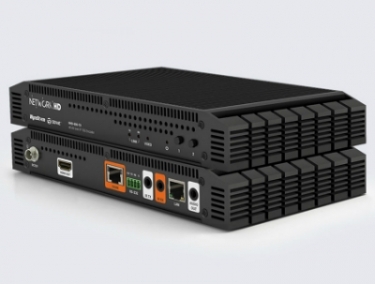 WyreStorm's AV over IP system solutions include the NetworkHD 600, NetworkHD 400 product lines, and the NetworkHD Standard Encoder.